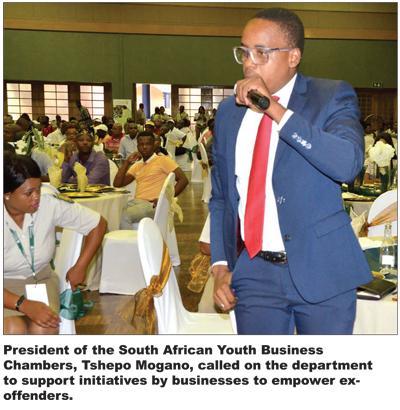 Minister Michael Masutha implored business people to help make easier, ex-offenders’ path to social reintegration by giving them a second chance, at a packed Rustenburg Civic Centre on 24 January 2019. The minister is on a nationwide programme to evaluate compliance with departmental policies and to address service delivery gaps. His visit was aimed at drumming up support among the business community to offer employment to ex-offenders. Masutha lamented that former inmates’ endeavours to turn their lives around are often stymied by the stigma associated with their criminal past. He said the department commits huge financial and human resources to rehabilitate offenders so they can become productive members of society when they are released. The minister underscored the role of employers as agents of change. “You are the catalysts for change, development and prosperity. The state can create a conducive environment for change, but for it to happen, it requires entrepreneurs that will generate economic activity and create job opportunities for some, and stimulate entrepreneurship and economic participation for others,” he enunciated. Masutha thanked the business community for its impeccable leadership and contribution to the growth and development of the country. “You are the people who ultimately have the power to eradicate the triple challenge of poverty, unemployment and inequality,” he added. He said the inmates and parolees are imbued with passion and unique skills which they gained whilst incarcerated. He said giving opportunities to ex-offenders to actively participate in the economy will enable them to fend for themselves and their families, and at the same time create jobs and reduce crime. Unemployed parolee, Evert Klaasen spoke about the daily struggles and stigma attached to her ilk, despite their efforts to earn an honest living. She said they are often treated as outcasts because of their criminal records and are denied economic opportunities despite atoning for their wrongdoings and changing their ways. Self-employed ex-offender and owner of Mabale Construction and Taxi Business, Elvis Mabale testified about how he started a small business selling basic amenities to fend off poverty. He is now running a thriving business that employs many locals, including ex-offenders. Business people and community members registered service delivery challenges and made proposal to help the department to improve, including partnering with stakeholders in different sectors of society. Also in attendance was ex-offender and renowned actor Israel Makoe, MMC of Rustenburg Local Municipality John Molubi, traditional leaders and prominent local business leaders.